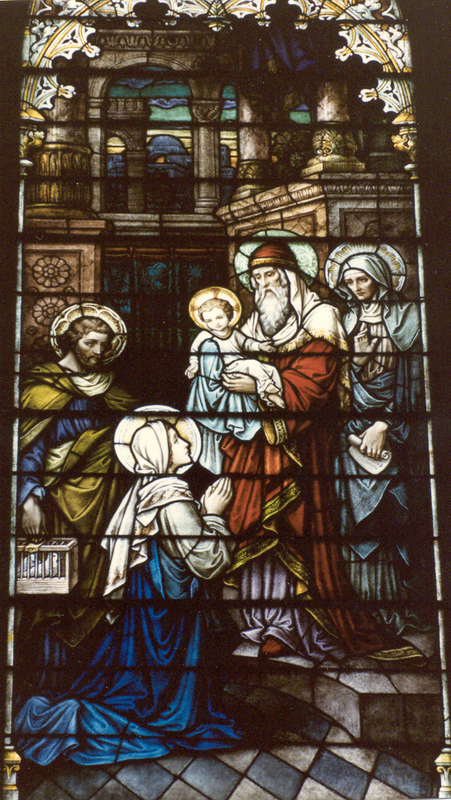 Simeon's canticle in the presence of the infant Jesus, Mary, and Joseph is a prophecy. It consists of two stanzas: the first is an act of thanksgiving to God, filled with profound joy for having seen the Messiah. The second is more obviously prophetic and extols the divine blessings that the Messiah, whom Simeon hold in his arms, is bringing to Israel and to all people. But then the Holy Spirit moved him to further prophecy about the Child's future and his Mother's. The words Simeon addresses to Mary announce that she will be intimately linked with her son's redemptive work. The sword indicates that Mary will have a share in her Son's sufferings. Hers will be an unspeakable pain that pierces her soul. But Mary was prepared for this sorrow and suffering through the angel Gabriel's words to her and by keeping those words in her heart. When Jesus on the cross presented his Mother to John, all of us Christians were represented in the person of John, and we too are children of Mary. Our Lady's acceptance of John as her son shows her motherly care for all of us. Then, John the disciple whom Jesus loved brought Mary into his home. To bring someone into our home is to bring that one into our lives. The brown scapular of Our Lady of Mount Carmel is the sign that we have brought Mary into our lives. If through the scapular devotion we are going to bring her into our home, we might remember how she lived in her own home. And Scripture gives us a hint, as we are saying, at the environment in Mary's home. The hint is given at the very moment of the angel Gabriel's visit to Mary's home and his words to her. We can only imagine the scene. Mary was living in Nazareth in Galilee, some twenty miles from Mount Carmel. Her life was the life of all simple girls: work, prayer, poverty, great poverty, but joy too, and above all hope in the destiny of Israel. She lived with Anna, her mother, in a simple little house with a courtyard in front surrounded by a wall built on purpose so that the women could live in freedom and privacy. She often went into the courtyard to work and pray. She felt these two activities intimately linked and was full of peace and joy. One day when she was alone in the courtyard, she felt herself suddenly bathed in light. She had been sitting on a stool praying. She then felt a great joy invading her whole being. She was happy to let herself be filled by that radiance. It seemed a sign of God's presence enfolding her like a garment. Suddenly the light took on the shape of an angel who told her three things. These three things could be problematic for most of us. Even Mary had to ponder them over for a while. These three problematic things did not have to do with Mary's being the Mother of God, but they were to be a light for her in carrying out God's will that she be the Mother of God. that part of the message had not come yet. Before she was asked to agree to an action, she was told to agree with three statements that God was making about her. What were these three statements? She was told to be joyful. She was told to accept the fact that God loved her (indeed, that she was highly favored). She was told to trust in God's abiding presence. "Rejoice, highly favored one. The Lord is with you" (Lk 1:28). These statements present a challenge no human can easily be comfortable with. But we must make the effort to listen to them if we are going to take Mary into our home. When she comes into our home she speaks these same words of the angel to us. And they will serve for us, too, as a light for carrying out God's will in our lives. A mood of bitterness can make it very difficult to hear such an astounding message. How can I respond to the call to be joyful, if my mind is chained to a sense of sadness? How can I know God's love if my heart is weighed down with loneliness and non-love. How can I trust God's care, if my soul is consumed by discouragement, cynicism, or a distrust in everything and everybody? To some degree we all have reasons for resonating to arguments persuading us to be bitter about our present state in life. To the degree that we listen to these messages, we will be blocking out what God is saying, inviting us to begin to live a life of grace as Mary experienced it: "Rejoice; know my love for you; trust that I am with you." If Mary had been like some people, she would have protested unhappily: "How can I rejoice? I have all those worries. I am so poor. It's easy for the rich and the well-off to rejoice. What if I get sick. I wouldn't be able to pay the medical bills. My relatives show no interest in me. Who will care for me in my old age? The synagogue doesn't care about anybody unless they have money. And on and on she could go with life's many worries. Mary could also have responded, "if God thinks so highly of me, why am I so poor? And if the Lord is with me, why did he let my father die after I prayed so hard that he wouldn't die? These are a few ways Mary could have responded, but of course she didn't. However, there are others who do object to such words and turn their backs on God. Mary did not resist the call to "rejoice"' be loved and learn trust." She did not insist on her right to fuss and fidget over depressing situations. She said, "let it be." She let go of all tendencies to resent those things in life that made her uncomfortable; and all those things that gradually would have made her feel unlovable and unsure of trusting anyone. We all see the way people express their joy at a football or soccer game. When the winning point is scored. They jump up and down, they lift up their arms, they leap into the arms of others, they shout and scream. But such joy is hardly the joy the angel was speaking about when he told Mary to rejoice. St. Luke's gospel is the gospel of joy. But the joy in this gospel is the joy that comes from the Holy Spirit. The joy of the Holy Spirit is God's gift. We cannot produce it ourselves. It doesn't come from some lucky circumstance. It comes to the one who is able to say with Mary, "Let it be done to me according to your will." This spiritual joy surpasses all the other joys that are dependent on created things or other persons. This joy accompanies the inner freedom that comes from letting go. Next, Mary tells us, each of you, that you are highly favored by God. I wonder if you would believe her. Of course, we are not full of grace in the sense that Mary was. Yet it is a part of our faith that God loves us; and so we are highly favored by God. Mary could have said to the angel, "Oh, there are many others better than I am. There are others much more qualified than myself. Why me?" Are these our responses to God when he tells us he has loved us with an everlasting love. Shouldn't our answer to God's love be "what would you have me to do, Lord; let it be done to me according to your word." "The Lord is with you." "Trust that I am with you." This isn't going to work out. That is what we are inclined to say when we see our ship tossed about by the storm. When spiritual writers say "Let go; let it be," they do not mean to say that you give up trying. God took the initiative in Mary's life, and so he takes the initiative in our lives. God first loved us, the Scriptures reveal. We would not be able to respond to God if he had not first called us. I must respond to God's call with a yes. I have to try to express my yes in the activities of each day that are my duties; I must try to say yes to the Holy Spirit's good inspirations. When we're tempted to ignore our responsibilities and take an easier course in life, we must remember Mary and the angle's words to her, which are also directed to us: "The Lord is with you." When we bring Mary into our home, we bring a whole new spirit, like a new immaculate garment, into our lives. We must let the scapular of Our Lady of Mount Carmel remind us of this spirit. Each day with Mary we can listen to the angel's words as though spoken to us by Jesus: ' "Rejoice; you are highly favored; I am with you." And then in any sword that pierces the heart we will be able to find meaning.